Grand Reef takes you to the depths of the ocean in their truly magical playground under the sea. Offering over 150 casino games, cutting edge 3D animation & sound and a safe & secure gaming environment, Grand Reef Casino is the coolest place to be. Powered by Playtech, the casino offers both a flash & a download version and welcomes both real & fun players alike. The greatest appeal to Grand Reef is that they've taken a tried & tested product and tailored it to the needs of even the most adventurous gamblers around. It's fun, it's edgy, it's a welcome change from traditional casinos available online. 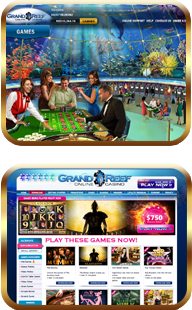 For a Deeply Thrilling online gaming experience, visit Grand Reef Casino today and take advantage of their magnificent Welcome Bonus Package of up to $750 free casino credits. Once you've played at Grand Reef Casino, you'll never look back. African Palace casino has recently re-launched, under new management to bring players a unique African Gaming Experience. The African Palace Casino Product is slick and sophisticated and brings players an outstanding range of games, powered by the leader in the casino software industry, Playtech. The casino client is set in an almost life like Africa Safari setting, and with almost 200 exciting games to choose from, there is something for everyone - from exhilarating card games to sensational slots, you are guaranteed hours of heart thumping gaming action at African Palace. All our games are tested by Technical Systems Testing North America Inc. (TST) to confirm their fairness and we openly display or monthly TST certificates on our website. Click here to view our latest TST certificates. 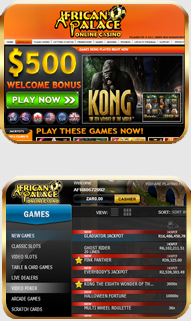 Winning is WILD at African Palace, so for an all round African Experience why not sign up today to take advantage of their magical Welcome Bonus Package of up to $500 free casino credits. 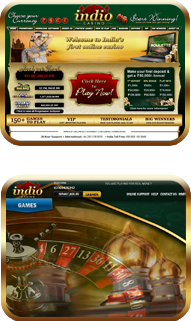 Indio Casino was established in 2001 and has recently opened its doors to the Indian nation. The product provides users with an interface where they can play online casino games from virtually any location in the world, provided that they have an Internet connection. The product offers over 150 of the most popular online casino games that can be played for both real and virtual money. Indio Casino combines cutting edge technology with stunning 3D animation and sound to bring its users the best online gaming experience available today. We are excited to see the potential of the Indian market and look forward to bringing a completely new gaming experience to residents of India. We are currently focusing on an online marketing campaign to test the propensity to gamble of Indian players. Once the market has been analyzed, further above the line campaigns may follow. All new players receive a 50% bonus on their first deposit up to: INR: Rs.50,000/- or $/€/£1,000 depending on the selected currency. Player Bonuses: 50% BONUS up to Rs.50,000/- FREE!